Whether you like to cook huge feasts or modest meals you'll find clever tech at the heart AEG cookers, designed to make your work in the kitchen easier. Its gas, electric and dual fuel cookers use technological innovations to give you better control over cooking, delivering delicious results. Discover incredible baking, grilling and roasting with AEG's multifunction freestanding and integrated ovens. AEG's electric cookers let you adjust heat faster when cooking. Rapid-response touch controls react quickly and accurately to give you total control and precision without delay. Also making sure you get the perfect temperature every time is the Core Temperature Sensor. It monitors the cooking process to help you to achieve the best possible cooking results, whether you're baking or roasting. AEG cookers feature multifunction ovens, a mix of fan-assisted and conventional ovens, so that you can get the best of both worlds. Fan cooking is ideal for achieving an even cooking temperature, while the conventional oven is ideal for baking. A built-in grill gives you even more flexibility in the kitchen, for crisping perfection. 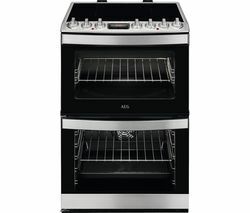 AEG's dual fuel and gas cookers help keep your home safe with flame safety cut-out mechanisms on all burners. This shuts off the gas supply immediately if a flame is extinguished accidently, so accidents are prevented. AEG's gas hobs give you serious power with its Triple Crown burner. Incorporating three individual rings of flame, each individual burner delivers maximum heat. Producing more heat than conventional gas burners, it's perfect for wok cooking and sizzling hot stir-frying. Bright, LED touch displays make it easier than ever to see and adjust the timer, temperature and cooking modes, for more precision during the cooking process. Wipe-clean touch controls are highly responsive and far easier to clean than buttons and dials. And the revolutionary induction hob offers cooking zones designed for pans of different shapes and sizes. With intelligent pan recognition, each element only heats the base of the pan instead of the whole area, making your hob as safe and energy efficient as possible. The full AEG cooker range also features the Cataluxe® cleaning system to make light work of cleaning. Its catalytic lining absorbs grease and cooking residue when heated to 230°C, so you can simply wipe clean after use.